Imagine cruising in luxury among the Spice Islands, where rival traders once fought over nutmeg that was literally worth its weight in gold. Or discovering an archipelago whose exotic flora and fauna inspired a contemporary of Darwin to reach the same conclusions about how life on Earth evolved. Or exploring a dense North Borneo jungle that the first European visitors swore was inhabited by humanoids with tails. 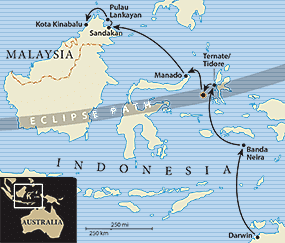 These are just a few of the extraordinary elements that TravelQuest has woven together in our Cruise to Totality in Indonesia and Borneo – culminating on March 9, 2016, when we experience a dramatic total eclipse of the Sun aboard our cruise ship in the Molucca Sea. Your journey begins in Darwin, cosmopolitan capital of Australia’s Northern Territory – where you can also join us on a pre-cruise excursion to view ancient Aboriginal rock art. From this historic port city, our luxurious 260-passenger ship, La Compagnie du Ponant’s Le Soléal, sails northward among the beautiful islands of the Indonesian archipelago and carries on through the Coral Triangle to Borneo and Kota Kinabalu. In the Celebes Sea we cross the famed Wallace Line – named for 19th-century naturalist Alfred Russel Wallace who identified the transition between the major biological realms of Asia and Australia. It was also Wallace, working independently of Charles Darwin, who developed his own theory of natural selection based on close study of the islands’ remarkable biodiversity. Sailing on to Banda Neira, we enter the heart of the Spice Islands, where trade in nutmeg and other spices still flourishes today. Fort Belgica, founded in 1611, serves as a concrete reminder of how jealously the islands’ aromatic produce has been guarded for centuries. Another highlight of your voyage is Sabah, the region of northern Borneo that remains nearly as mysterious today as it was three centuries ago when European explorers carried home tales of wild creatures encountered in the jungle (or in their overheated imaginations). Forming the northern tip of one of the world’s largest islands, Sabah’s rugged mountainous interior descends to magnificent rain forests edged by pristine beaches and idyllic islands. 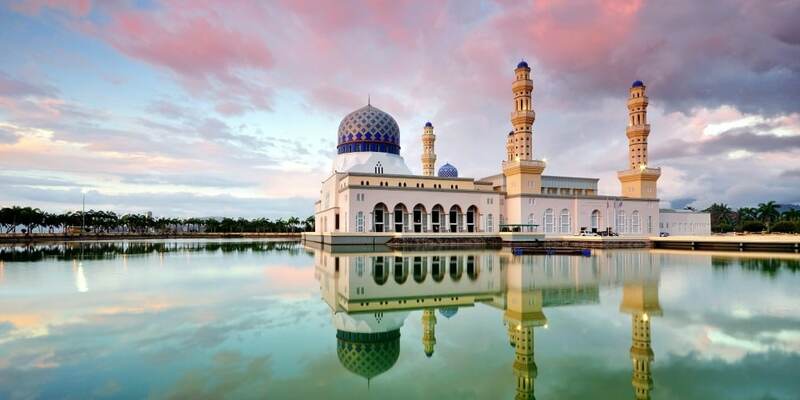 While technically part of the rapidly modernizing Federation of Malaysia, this remote land has a magical otherworldliness matched only by the charm of its welcoming people. The defining moment of your cruise adventure comes on March 9th at a carefully chosen location just southwest of the island of Ternate. Here you’ll gather on deck with your fellow eclipse watchers to stand for over 3 minutes and 10 seconds in the shadow of the Moon. Viewing totality at sea only magnifies the impact one of nature’s greatest wonders. And where better to experience it than in a corner of the planet that still has been so little explored? From the nightly spectacle of the southern skies to the diversity of marine life along the coral reefs of the Banda Sea, this is a journey filled with stunning natural beauty – punctuated by absorbing cultural adventures ashore. And as we sail to each new port aboard Le Soléal, look forward to an enriching program of talks from your expedition team, who bring to life the many natural, cultural, and astronomical discoveries along our route. 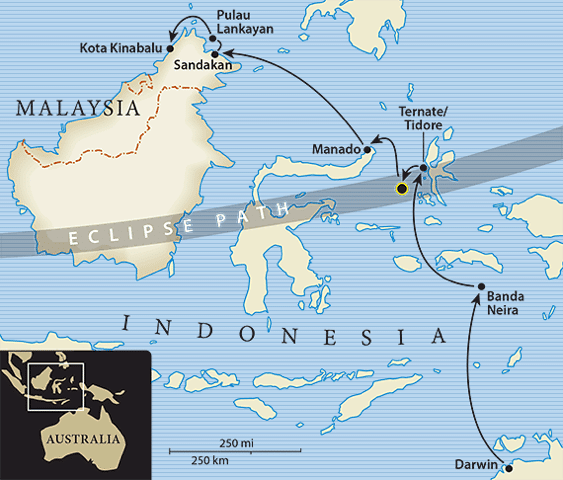 Even for the well-travelled, the islands of Indonesia and Malaysia provide endless fascination in their own right, while creating an unforgettable backdrop to a one-of-a-kind eclipse experience. No traveler's experience added yet.